This machine doesn’t carry a spare. The owner prefers to carry equipment to plug and inflate tires, and he trusts in the Moapa V eight-ply tires and the DWT beadlock rims to get him home. 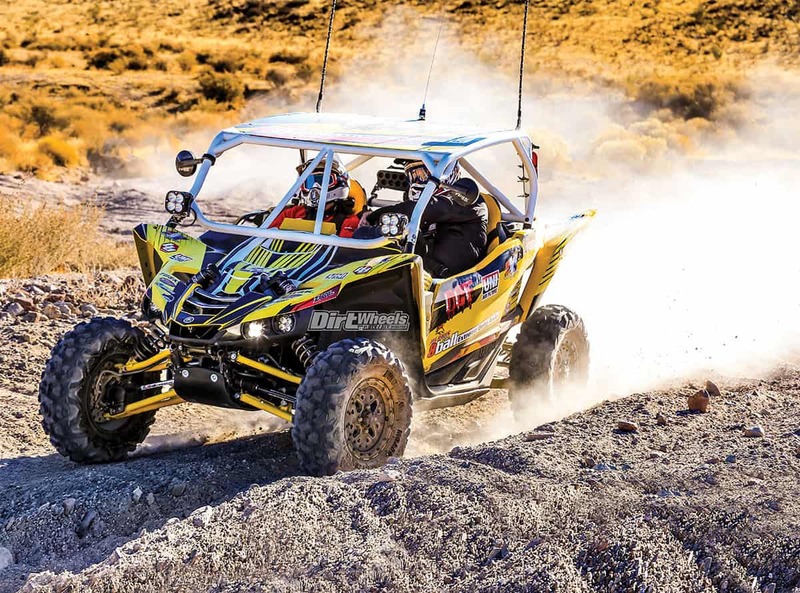 What do you do if you already have a high-powered Polaris RZR XP 1000 punched out to 1100cc? If you are Brian Carle, you buy a stick-shift Yamaha YXZ1000R to add to the stable. He is fortunate to live where he has plenty of room to drive. 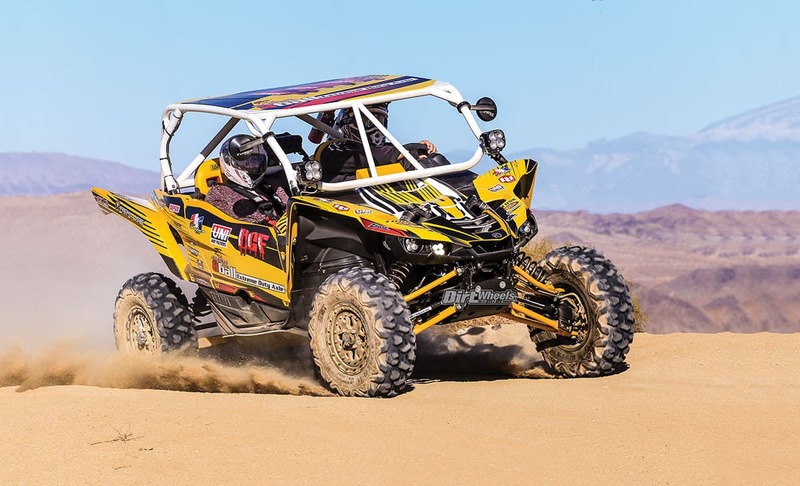 He stays with his trusty RZR for slow and technical outings and turns to the YXZ for faster, more open conditions. He lives in a rural desert area and has many opportunities to hit the trails, and he is often out on his own, so he likes his cars prepared for any situation. Yamaha’s YXZ1000R doesn’t love tall tires, so Carle stuck with DWT 28×10-14 Moapa eight-ply desert tires on DWT Sector beadlock rims. The rear tires are obviously narrower than the stock units, but traction remains very good, and the car slides nicely under throttle without any feel that the tires will catch and stand the car up. 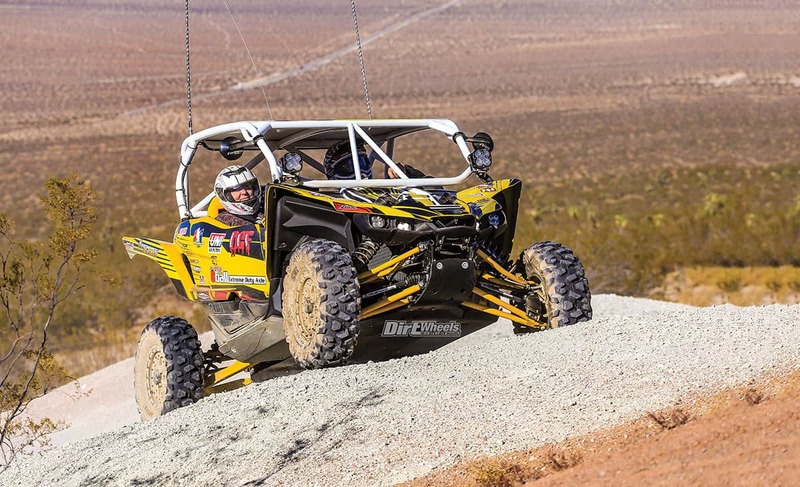 The YXZ1000R comes with Fox shocks that take very hard hits, but they also ride harshly on slower trails. ZBroz Racing massaged the stock shocks by modifying the internals and selecting springs to work well in the slow stuff. The suspension is amazing for smooth riding, yet it retains control in whoops. There is still a bit of the YXZ rear kick-up, but it isn’t bothersome at all. Between the DWT beadlock wheels and Moapa V tires, the YXZ is most willing in the turns. The rounded tire profile lets the rear break loose smoothly and safely. Like many serious drivers, Carle was concerned with safety, so he added a stronger Brick City Fabrications roll cage with a roof and intrusion bars. Unlike some cages, vision remains quite good. Carle chose to trust the Moapa tires, so he had no tire carrier added to the cage; instead, he has a well-stocked bag from Tusk to carry a range of tools and tire repair products. For the upper light system, he went with Squadron Racer cage-mounted lights. They are like having a light bar without taking up the room of a light bar. For rear protection he mounted a RTL taillight on the back of the roll cage, which also has a built-in backup light. A Rekluse auto clutch makes the YXZ1000R manual transmission so much nicer when you are doing slow and technical driving. You simply cannot stall the car, and that is nice. Carle never rides without a fire extinguisher, so he installed a Tusk quick-release fire extinguisher on the rear of the roll cage. He also likes to see who he is dusting behind him, so he installed a set of Tusk rear-view mirrors, which are very affordable compared to most mirrors out there. Carle opted for Simpson seats and belts. He claims the Vortex seats are the most comfortable he has ever experienced, and we agree that the seats are very nice. Carle liked that you can go to Simpson’s website and design your own seats. The belts are easy to use and make you feel secure as well. Carle further dialed in the cockpit with an NRG Innovations custom quick-release suede-covered steering wheel. This wheel is a real pleasure to hold on to. For communications, Carle chose Rugged Radios’ 60-watt car-to-car radio and RRP660 intercom system. Carle had trouble with the YXZ gas pedal being overly small and sitting high. To resolve the problem, he welded a piece of flat-bar steel to the bottom of the gas pedal to make it longer, and he has not had his foot slip off the pedal again. Carle had nothing but praise for the Simpson seats and harness-type seat belts. We have to agree with his evaluation. This is a comfortable and effective cockpit to spend miles in. 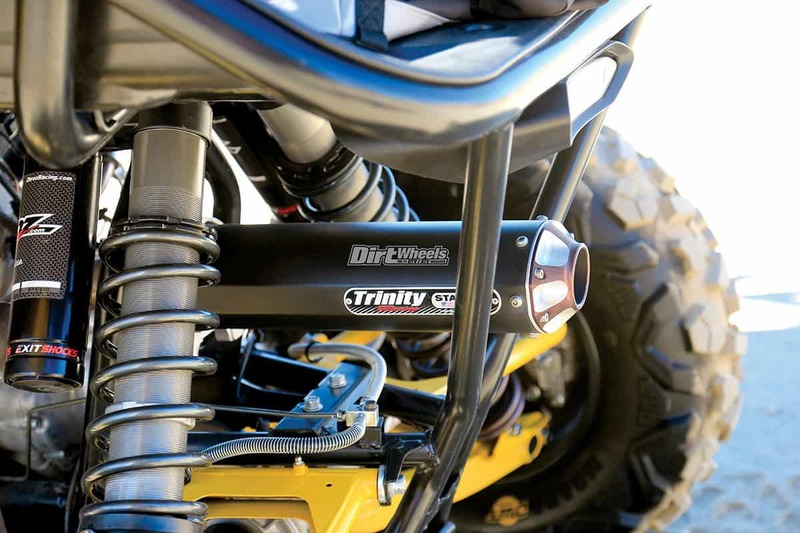 When he is racing on a closed course, Carle chooses to go with Trinity Racing’s slip-on Stage 5 exhaust. It was very easy to install and freed up some lost power. With the modified exhaust, he needed to dial in the fuel system, so he went with a Dyno Jet fuel-management system, including a Power Commander 5, Auto Tune module and a POD 300 display, which allows you to adjust the fuel system on the fly. On the Yamaha there is no need to worry about belt temperatures, but Yamaha did not include a water-temperature gauge, and no one wants to run a car without knowing your engine temps. Razorback Technology came to the rescue with a simple-to-install water-temperature gauge for the Yamaha. With the Rugged Radios in place, there is no room for gauges, so Carle fabricated his own gauge panel. Owner Brian Carle selected a Trinity exhaust to aid the YXZ power. 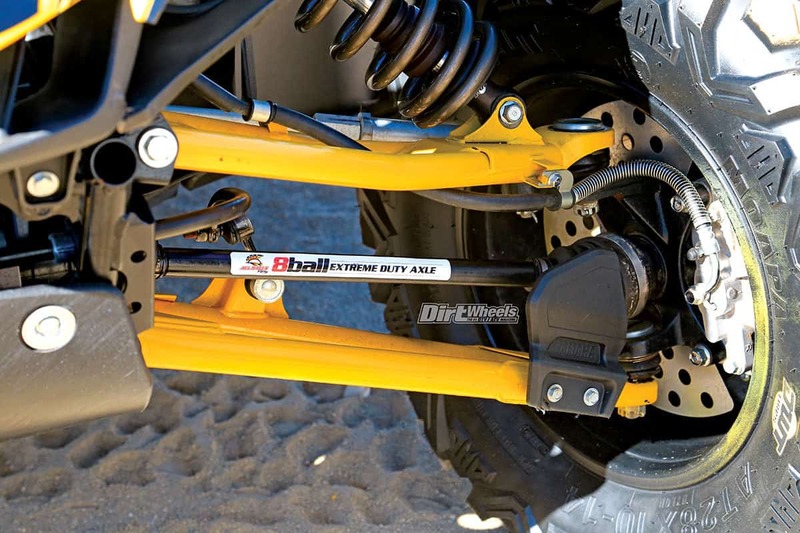 The ZBroz Racing suspension mods give the machine an amazingly smooth ride in the rough. The thing that makes the Yamaha YXZ1000R so different from the rest of the machines out there is the manual five-speed transmission, but it seems to be a love-it-or-hate-it option. Those that love the ability to shift gears but have a difficult time with the clutch are saved by Rekluse clutches. It has developed a centrifugal clutch system that’s easy to install and makes the car so much easier to drive. Carle said, “You can still drive the car just the same as before but without the worry of stalling it when taking off or going up steep hills—a must-have in my opinion.” Carle used a Rekluse design that is available directly from Rekluse and is different from the Rekluse that Yamaha sells. The Yamaha has a dry-sump oiling system that contains a reservoir that holds the oil. It has been known to crack and leak oil. CFM Performance has developed a thicker and stronger welded tank that eliminates the possibility of the tank leaking. Anticipating hard use in Arizona, Nevada and Utah, Carle upgraded to 8-ball heavy-duty axles. Pivot Works sells all sorts of axle and suspension- related UTV parts at reasonable prices. We chose the varied and interesting terrain around the living ghost town of Randsburg, California. We chose to take off from the Goat’s Sky Ranch Hotel and pizza place right on the main street of Randsburg. You can legally drive (slowly) on the street to reach legal routes out onto the trail system. For any technical driving, the Yamaha manual shift usually takes some concentration, but Carle’s YXZ is quite easy to drive. You don’t even have to push the clutch in to engage low gear. Just ease into the throttle and the car takes off super smoothly. We can’t imagine anyone being able to release the clutch so smoothly. Once you are driving, you use the clutch just the same as a stock machine. It is when you are starting off or pulling the rpm way down that the Rekluse makes it impossible to stall the engine. It works fabulously. Even in the fairly open terrain around Randsburg, it does take a moment for the machine to pull from gear to gear. Even if you spin the engine to redline in a gear when you upshift, you still end up below the rpm range where the engine pulls hard. While the engine is revving, the Yamaha makes amazing power and accelerates hard. It doesn’t feel like it gives much away to turbo cars. This particular Yamaha is extremely comfortable and secure feeling. Everything in the cockpit feels completely dialed in. We don’t usually get excited about steering wheels, but the NRG wheel is really nice. We like all the controls, but the Rekluse clutch is certainly the star here. 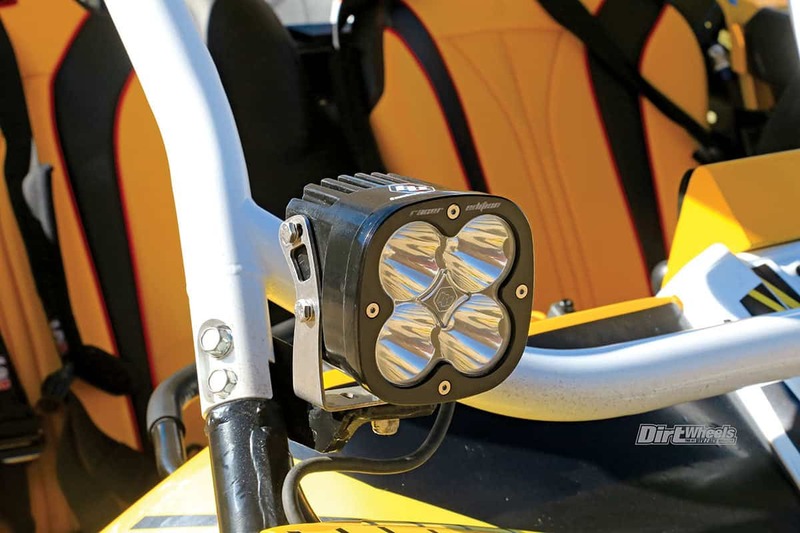 Between the Baja Designs LED stock headlight replacements and these LED pod lights mounted to the cage, Carle feels he has as much light coverage as a light bar would offer. After the Rekluse, the ZBroz suspension grabs your attention. This is an extremely smooth-riding car. We had a high-end Polaris four-seater along, and the suspension always feels amazing on those long-wheelbase cars, but the Yamaha was every bit as smooth over the rough and chop. We crossed some rocks, and the trail dropped off a cement-step crossing under railroad tracks. At that point we were glad to have the Factory UTV half-inch UHMW plastic skid plate protecting the bottom of the car. All the costly components are on the bottom of the car, and the full skid plate offers plenty of protection. 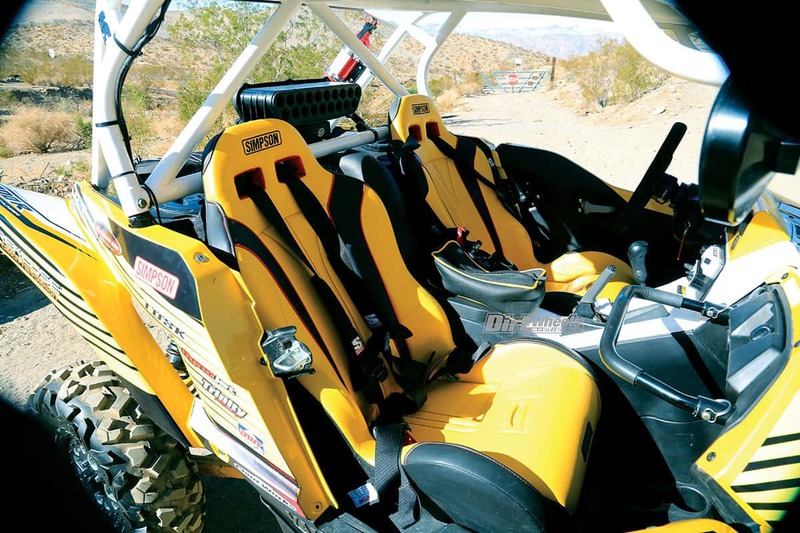 This is one YXZ that we would be more than happy to have in the garage. It is fun and easy to drive with crisp handling. The interior is comfortable with all the features you could want. We didn’t have speakers in our helmets or a radio in the other car, so we weren’t equipped to use the radios or intercom, but we have experience with them, and they work extremely well. Spider Grafix gave the car a unique look. The DWT wheels and tires provide the perfect balance of traction, flat resistance and weight to allow the car to perform to potential. Brian Carle is a man with a plan, and the plan is to have fun.